Thanks to ‘Ms. 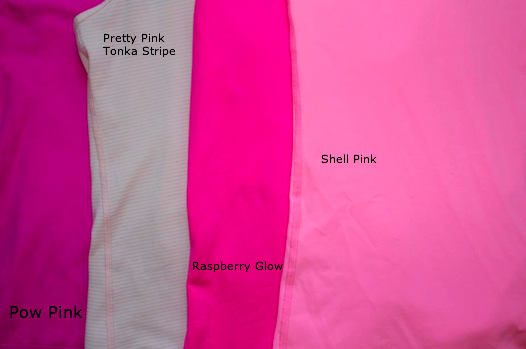 D’ from one of the Lululemon Facebook Groups we have a pretty accurate color comparison of all the latest pinks. The Pow Pink featured in this picture is the most recent Pow Pink from summer 2012, not the original Pow Pink from 2009 which was more like the more recent Raspberry Glow. Confused yet? "Some Interesting Rumors: Lululemon Stores are Running In The Red"